Perhaps the most ignored major appliance in the household is the outdoor BBQ Grill. Whether fueled by propane or natural gas, we count on it to provide us with memorable meals for our family and friends. We count on it to be ready to cook our kabob’s and steaks, but its just so easy to forget that it needs cleaning too. It’s so easy to walk away from that hot grill and go inside and eat your meal with your family and friends, socialize and forget there is a dirty grill waiting for you. They say strike when the iron is hot, and that goes for your grill too. It’s best to clean it 20-30 minutes after your finished grilling and it has cooled down but is still warm. This ensures that the grease and fat deposits have not solidified and are easier to clean.Here is The OC Grill Cleaner top 10 tips to maintain your Barbecue Grill. Use a wire (or stiff nylon) brush to brush off your food remnants after cooking. Once a month or every five BBQ sessions, wash your grill grates with Dawn soap in the sink. Check the drip tray to ensure it is not overflowing with grease. Check your burners for blue flames (desired), and note if orange flames (not desired). Wipe exterior of grill and shelf’s with dawn soap and water. Use Micro-Fiber towels to wipe the BBQ grill exterior – don’t use anything that can scratch it (abrasive). Cover your BBQ Grill with a quality outdoor BBQ Cover. Always look for loose nuts and bolts on the ground near the Barbecue. Check the thermometer for a semi-accurate reading. Always inspect the gas line for cracks and wear. These easy steps shouldn’t take long and can keep your grill working for you when you need it the most.Some questions that may indicate you need our BBQ Grill services are:Q. Are your BBQ gas valves not turning smoothly? Are they frozen?Q. Is your BBQ grill only getting hot in certain areas (Hot Spots)? Time for The OC Grill Cleaner. Does your BBQ Grill not get hot anymore? Temperature won’t get above a certain degree?Q. Are flames flaring up? 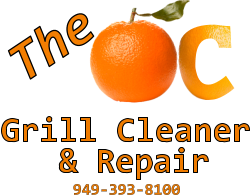 This is a sign it’s time for a deep professional Grill cleaning.Our recommendation is to have your grill cleaned professionally by us at least once per year.The OC Grill Cleaner comes to your location and performs the following cleaning and maintenance steps on your BBQ grill. Check for gas leaks using a gas detection probe. Check firebox for wear and cracks. Ensure all nuts and bolts are tight. Use of Professional eco and food safe cleaners only available to us. Soak dirty BBQ parts (grates, warming rack, flavor bars, briquette trays in a heated steam bath of degreasing solution in our portable dip tank. Remove and clean all grease and stains from interior of grill. Clean and polish exterior of grill. Check and inspect grill for proper operation. Provide you with a list of repairs and parts needed. Perform repairs if required from inspection. We hope you enjoy your BBQ’ing events and thank you for reading our tips.